February data on dairy imports and exports was recently released. While there is lots of discussion on dairy exports available from different news sources, there is not much discussion on dairy imports. 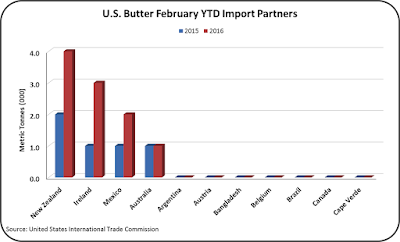 Dairy imports are really the changing factor in demand for U.S. produced dairy product. Exports are still down, but the currently developing news is imports. When commodities like cheese and butter are imported, it reduces the internal demand for U.S. produced products. 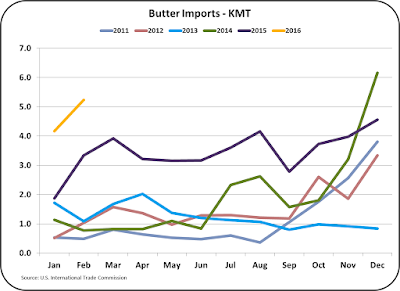 Imports of dairy commodities have grown tremendously over the last year as dairy processors are taking advantage of lower priced dairy products available on the international market. 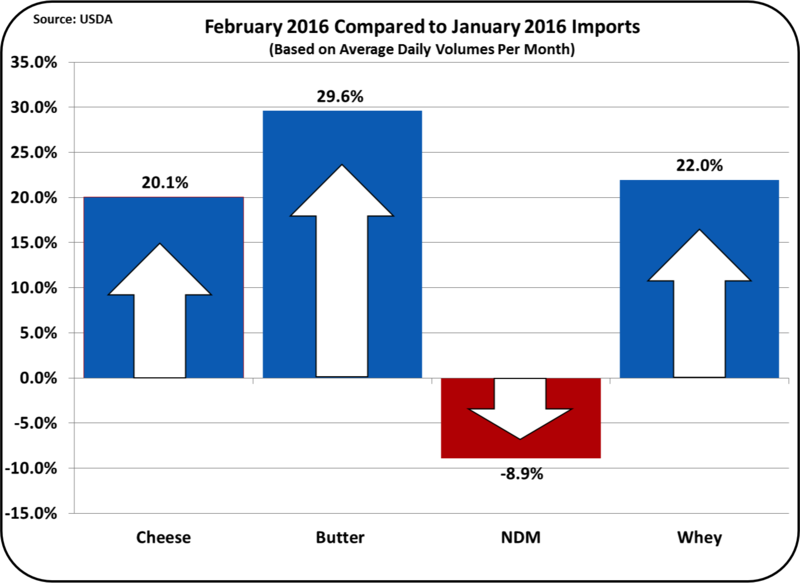 The three charts below show the increase in dairy imports of cheese, butter, and NDM/SMP. These imports were up tremendously in 2015 and are continuing to grow in 2016. Where are these imports coming from? 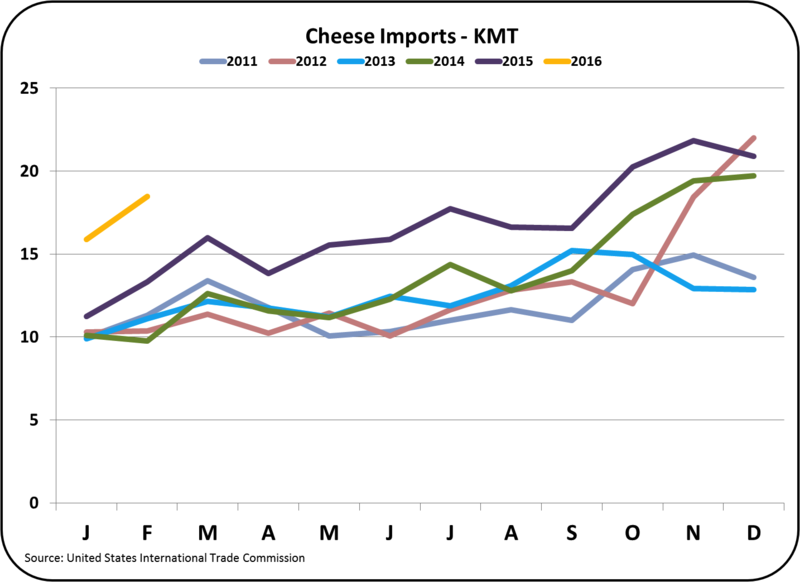 A quick review of the three charts below identifies the changing source of imported cheese, butter and NDM/SMP. It is New Zealand. Cheese imports from New Zealand are up nearly 6 times the level of 2015 for the same time period. Butter imports from New Zealand are show a similar trend, doubling in 2016 compared to 2015. 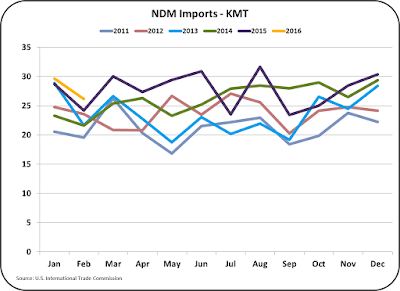 NDM imports are not up significantly, but they are up, and the source in New Zealand. New Zealand is a major exporter of dairy products. They have approximately half of the number of lactating dairy cows as the U.S., however, as much as 95% of New Zealand's dairy products are exported. New Zealand is the world's largest dairy exporter. As well as increasing imports into the U.S., New Zealand has also taken export customers from the U.S., reducing U.S. dairy exports. While there are other major dairy exporters mostly in the EU, New Zealand is the primary exporter to the U.S. New Zealand has been hit with a huge reduction in sales of dairy products to China. The lost volume is being exported to other customers at significantly reduced prices. As a result, most New Zealand producers are losing money. 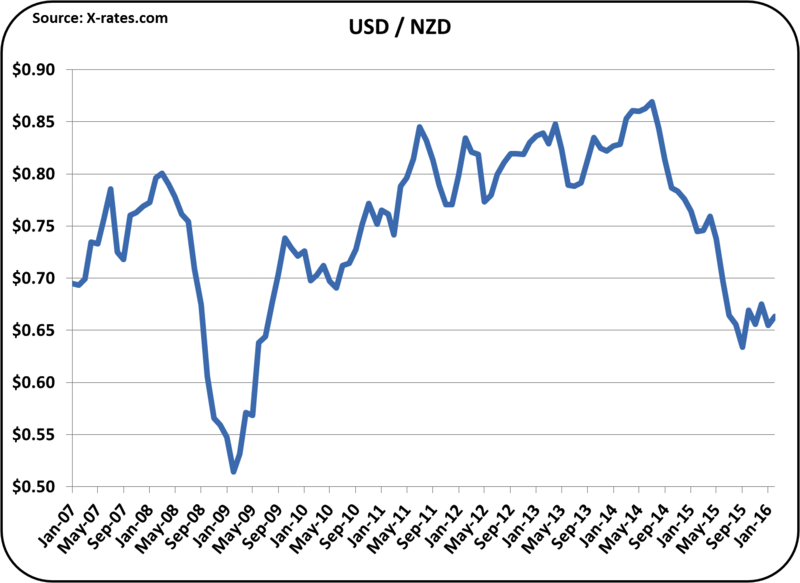 Exchange rates are also favoring New Zealand. 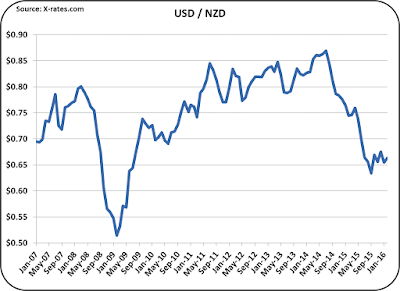 From 2014 to the present, the value of the NZD has dropped nearly 25% vs. the USD. When measured in USDs, that has made New Zealand dairy products 25% less costly. This has created a strong incentive to buy New Zealand dairy products. 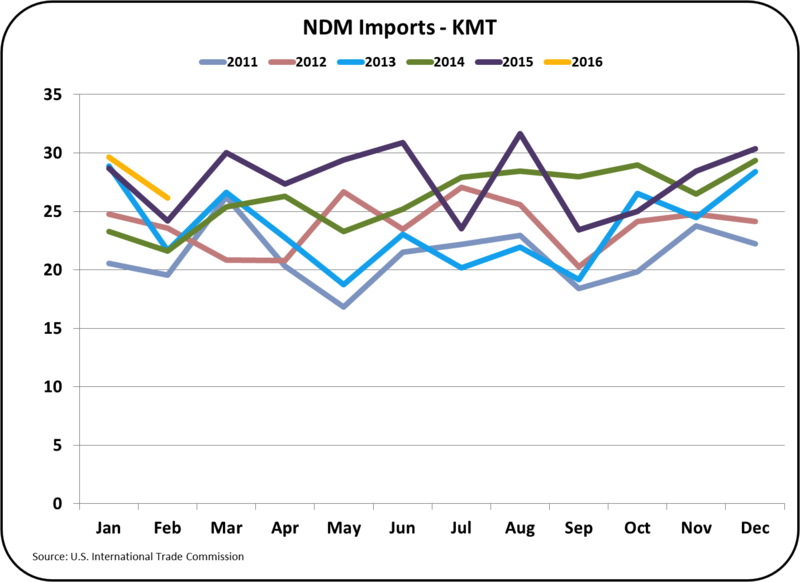 The U.S. has kept exports of NDM/SMP at high levels, but with significantly reduced prices. 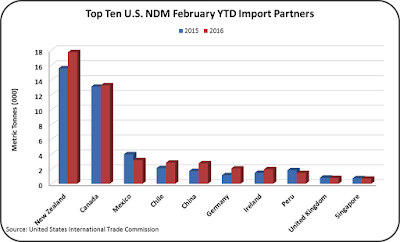 In U.S. has always produced NDM, but the global standard is SMP. The only difference is that SMP must have a proven protein content of at least 34%. The U.S. has responded to this with an increase of 20% YTD in SMP production and a 10% decrease in NDM. Cheese prices are the basis for the Class III milk price. 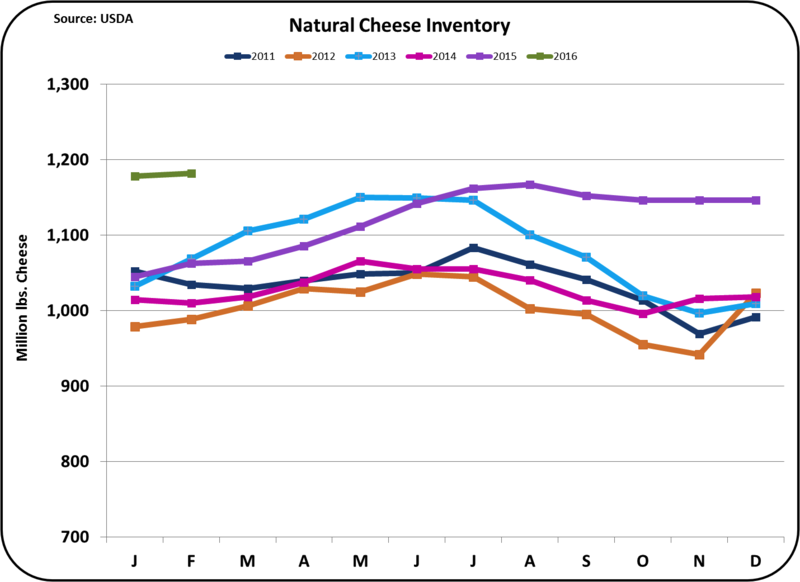 As discussed in the previous blog post, cheese inventories are high and the high inventories are depressing the domestic price of cheese. 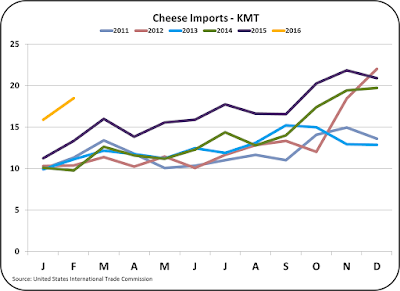 The biggest factor in this increase is the change in exports and imports of cheese. 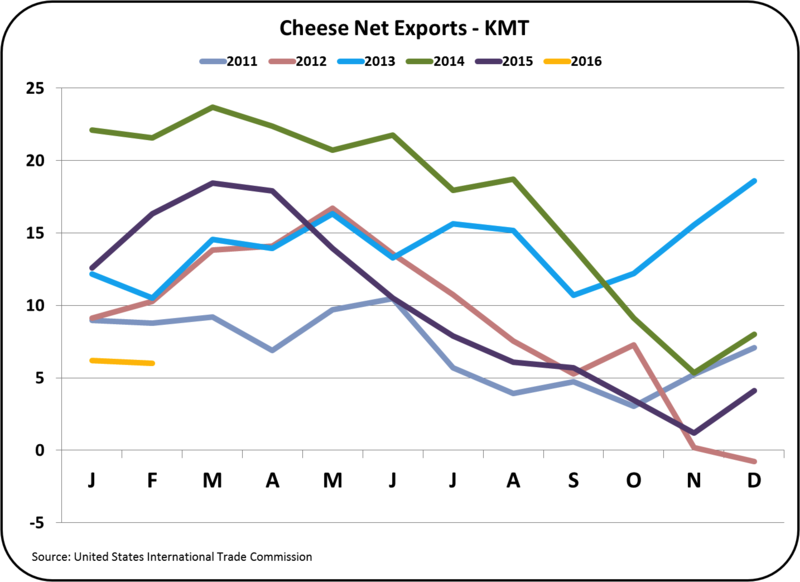 Below are three charts that show cheese exports, cheese imports, and the resulting cheese net exports. They clearly show that the biggest culprit impacting U.S. cheese inventories is the increase in cheese imports. 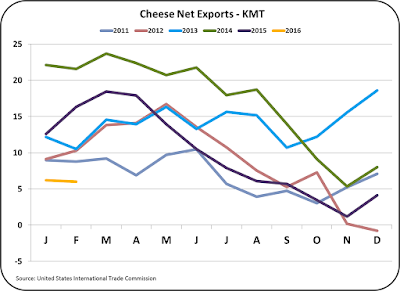 Cheese net exports are now at a six year low. 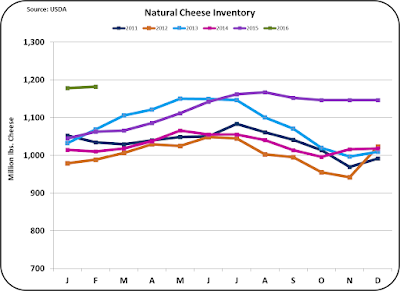 Domestic production of cheese has not reacted to this change and as a result, the inventories are building. It will take months and perhaps the entire year of 2016 before cheese inventories are brought in line. Until the inventories are reduced, cheese prices and Class III milk prices will not improve. This blog will continue to follow this disturbing trend and other changes as they develop. On March 30, March Class III Milk and Component prices were announced. For the first three months of 2016, cheese prices have remained stable at $1.52/lb. Because cheese prices have remained stable, the Class III milk price has also remained stable at $13.74/cwt. Butter prices have dropped to a six month low of $1.99/lb. 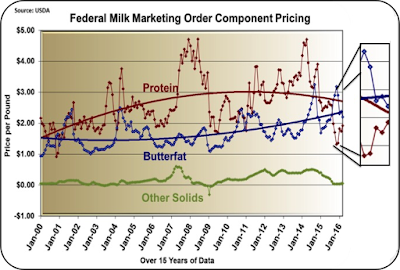 The drop in butter prices has caused a lower butterfat price, but a higher milk protein price. 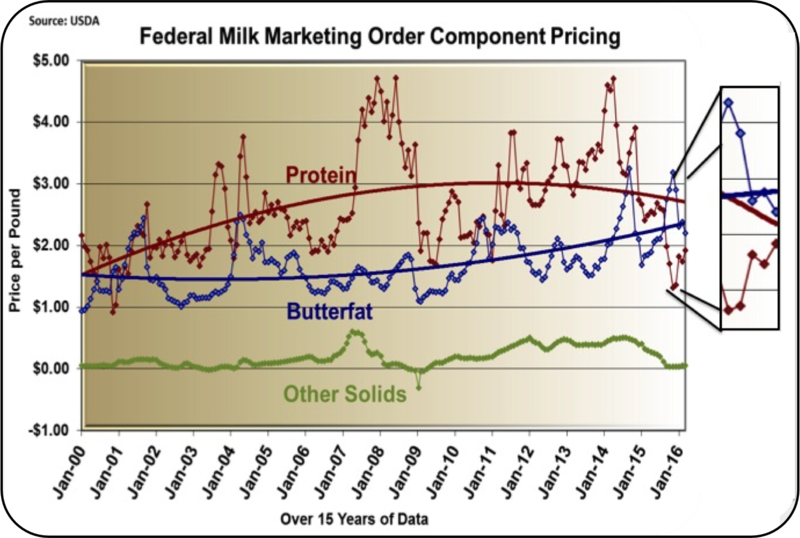 The blow-up on the right hand side of the chart below shows the five-month trend of decreasing butterfat prices and increasing protein prices. Butterfat at $2.20/lb. is still worth more than milk protein at $1.92/lb., but as these prices normalize, milk protein will likely return to be more valuable than butterfat. When butter prices were extremely high, it made butterfat more valuable in butter than in cheese. Therefore, the milk protein prices went down and butterfat prices went up. 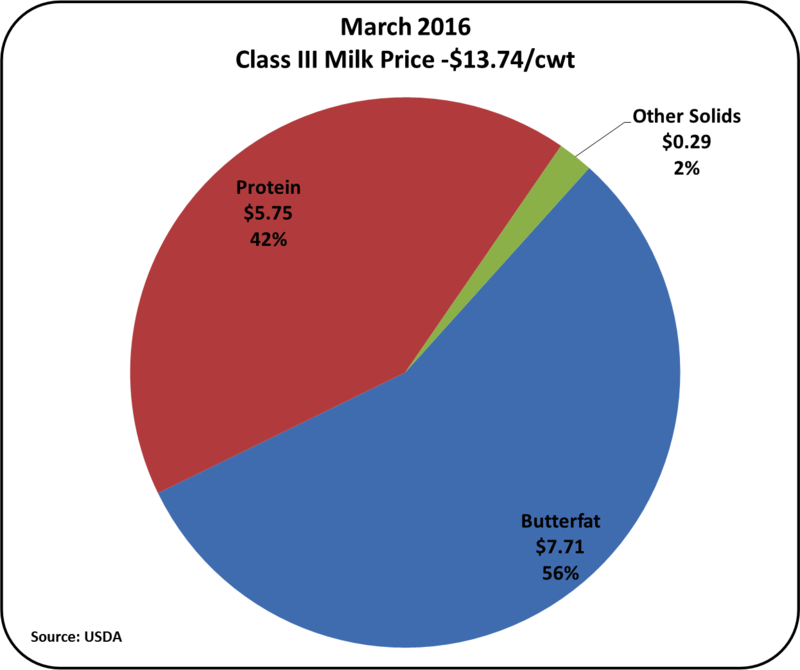 Overall, the change in butter prices has very little impact on the Class III price, which is the basis for initial payment, to the majority of U.S. dairy producers. 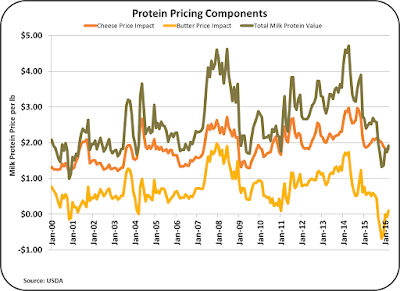 The chart below shows the cheese and butter impact on the milk protein price graphically. The two components adding to the total value of milk protein (shown in green) are the cheese price impact (shown in orange) and the butter price impact (shown in yellow.) The bottom yellow line on the graph illustrates what happens, when butter prices are extremely high. Withe high butter prices, the contribution of butter price to the value of milk protein becomes negative, as it has been for the last four months. This negative value is very unusual. It would appear that the relationship of these factors is trending back to a more normal situation. For more detail on this relationship, see the September 6, 2015 post to this blog. The decrease in the butter price will change the pie chart shown below. At this time butterfat is still contributing the majority of value to the Class III price. However, the relative size of the slices is continuing to trend back to more normal proportions where milk protein contributes the majority of value to the Class III price. As this trend continues, it does increase the financial incentives to produce milk protein with techniques like balancing the amino acids of feed. To evaluate the economic returns of amino acid balancing with up-to-date values for components, see the website milkpay.com or download the apps with the same name. The concerns about the overproduction of cheese remain. 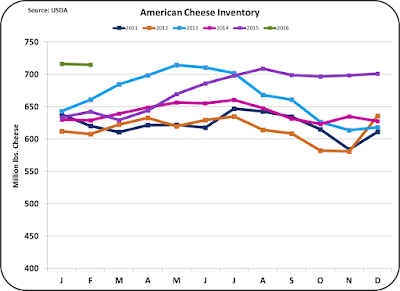 The inventories of cheese remain very high compared to historical levels. Because cheese prices dominate the formula based pricing of Class III milk, higher cheese inventories typically mean lower cheese prices and in turn, lower milk prices. 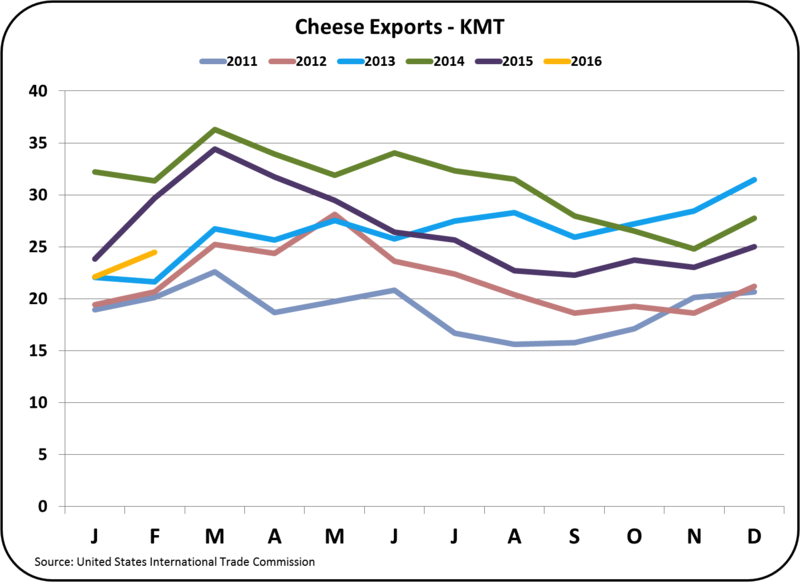 Cheese production remains high while exports remain low. 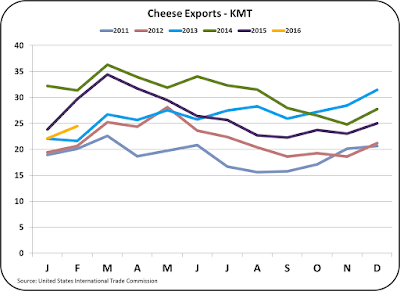 Cheese from the EU and New Zealand have flooded the international markets causing oversupply and significantly reducing international prices. 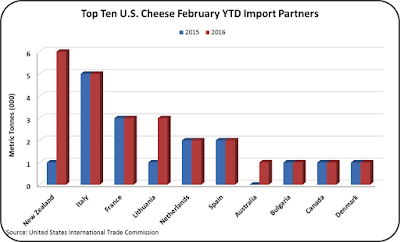 This has decreased exports of cheese from the U.S. and significantly increased imports. 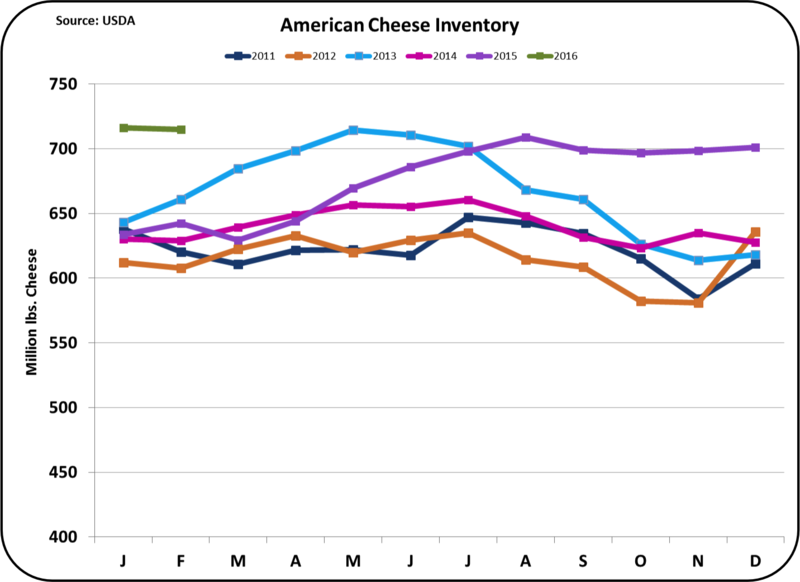 U.S. cheese prices as measured by NASS and the CME indicate a continuing stable price for cheese for the full year of 2016. This translates into a relatively stable, but low price for Class III milk for the remainder of the year. See the April 23, 2009 post to this blog for a detailed explanation of the close relationship between cheese prices and the Class III milk price. Most other inventory levels of commodities used to price milk remain at reasonable levels. Dry whey inventories are slightly high, but butter and nonfat dry milk inventories remain at a very reasonable level. Butter futures are showing a slight increase, but with the international markets pricing butter well below the U.S. domestic price, lower prices are definitely possible. 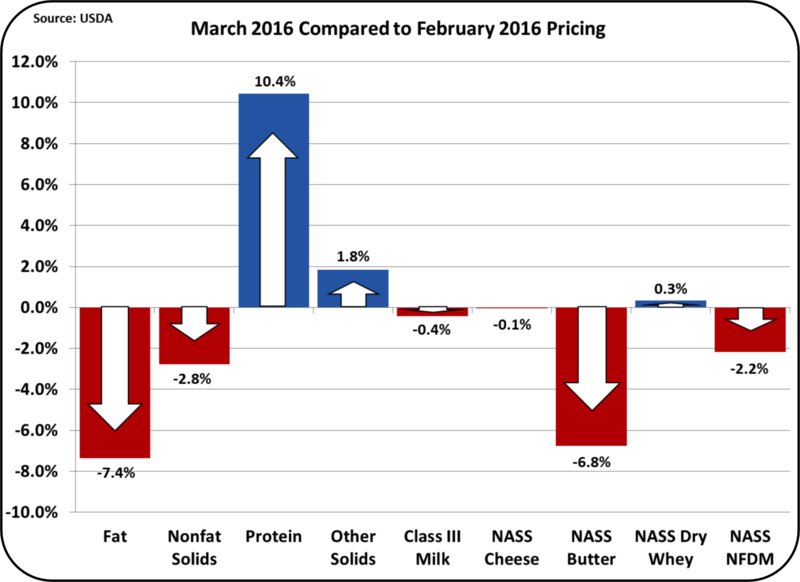 All factors considered, Class III milk prices will probably remain stable for the remainder of 2016. Once current export/import data is available, it will be analyzed in the next post to this blog.